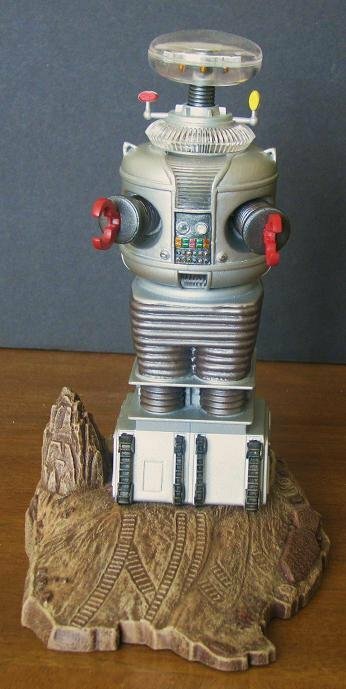 I was contacted several weeks ago by a new client who wanted a Lost In Space Robot model with working lights. He wanted as many working features as possible but had no lighting kit. He asked me what I could come up with on my own. I suggested a fully operational chest plate and, after some thought and research, I built the prototype which is shown above. 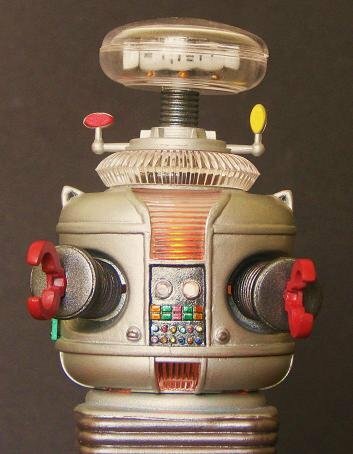 The Robot kit I had on hand was from the Polar Lights Dr. Smith and B9 so I used that one. It was built as all of my projects with ALL seam lines eliminated. The model was painted in automotive laquers, acrylics and transparent paints. The arms were modified and pulled into the torso section to make a more realistic pose. I planned to use both blinking LEDs and Fiber Optic strands of different diameters. The first step was to take a micro drill bit in a pin vise and drill holes in the 12 small lights in the bottom of the chest plate. After this step, the 2 larger lights were drilled in the 2 large chest lights. These were enlarged and cleaned up with a miniature bead reamer. When all the holes were drilled in their proper locations, the model was painted. The ends of the fiber optic strands were "mushroomed" at the ends with a miniature heat gun. When the torso section was completely painted and clear coated, the strands in the 12 smaller lights were fed through, attached from the back and secured in groups of 4 with heat shrink tubing. I used 3 blinking LEDs housed in the bottom of the base to operate the fiber optics. 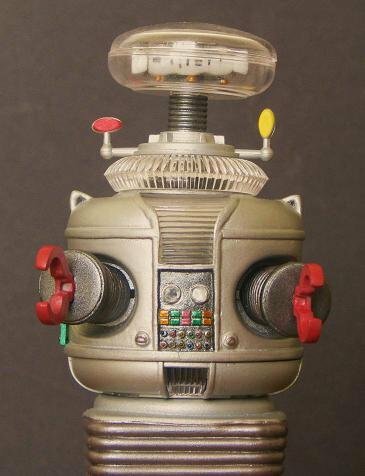 These all blink at different rates giving the appearance of the 12 small lights blinking in a random pattern as on the full sized Robot in the series. I used larger diameter Fiber Optic strands for the large 2 blinking chest lights. Each strand was attached to a separate blinking LED with heat shrink tubing and fed through the bottom of the base. This also gives the appearance of each light blinking at random. Three (3) strands were attached to the top of the "brain" inside the bubble and the ends were tinted orange. These blink in unison. Finally, a flashing orange LED was put inside the torso to make the chest light blink slowly. This realistically simulates the Robot speaking. The clear voice plate piece was "frosted" before installation. The model runs on a single 9 volt battery which is housed on a clip under the base. This model has no visible power switch. It is run on a magnetic reed switch. The lights operate when a small magnet is held close to the location of the switch. In this case, the switch is attached to the bottom of the base near the rear. 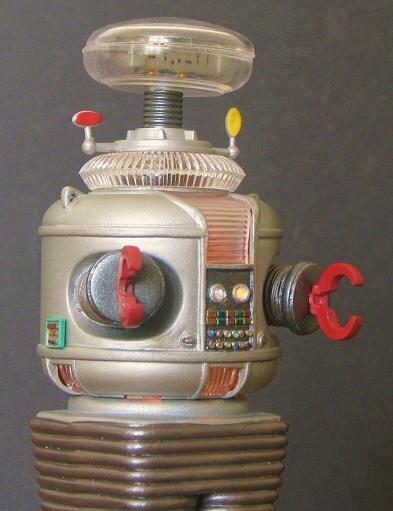 When the magnet is placed at the rear of the base, the voice box flashes and the chest lights blink giving a very realistic appearance. I hope you enjoy the photos. If you would like this or a similar project built, please visit the website at www.geminibuildupstudios.com or Email to Az6603@aol.com with any comments or question.